As time passes and the ocean churns, Daiwa keeps its footing as leaders in innovation. Each new year brings advancements in fishing gear and 2019 is no different. One such area of improvement is apparent in the new Daiwa Proteus WN Rods. Staying true to the original Proteus design, WN rods turn to carbon fiber blanks. A shift in graphite technology and higher quality components make Proteus Winn rods a force to be reckoned with. Product: Daiwa Proteus WN Rods. Price: Middle to higher middle range. Those of you familiar with the original Proteus series know that Daiwa wraps them on top of a carbon graphite blank. One of the most noticeable differences in the Proteus WN series is a new type of carbon fiber construction. That and the brilliant blue of the Winn style grips which now cover the split handles. Winn grips replace the black X-Tube Grip on the original Proteus rods. As for the material of the new rod blanks, Daiwa introduces their proprietary X45 BIAS Graphite Fiber. Catch all the new advancements in the Features Section below. Making up the Daiwa Proteus WN Rods collection are 7 casting and 2 spinning models. All one-piece fast action blanks, they stand between 7’6″ and 8’10” tall. With power ratings that range from medium-heavy to extra-heavy, Proteus WN rods wrangle tough species with ease. They are suitable for use with either monofilament or braided line. Reading the meanings behind the model numbers is pretty straightforward. They all begin with the prefix PRTWN which denotes the rod type (the Proteus WN). Up next are numbers which represent the length of each rod. The first number tells the feet while the second tells the remaining inches. So the number 76 will be a seven-foot six-inch blank. All models end with the letter F for fast action while the letters just before show the rod’s power. MH is for medium-heavy, H is for heavy, and XH for extra-heavy rod power. There are certain specs that you can’t discern from the model number, such as the total amount of line guides. Both the 7’6″ and the 8′ Daiwa Proteus WN spinning rods make use of seven Fuji Fazlite ring guides. In the casting series, the 7’6″ rods wrap ten Fuji Fazlite ring guides while the 8′ and 8’10” rods employ eleven. Power ratings are one thing, however, the range of suggested line tests reveals the thickness of the wood. Or in this case, carbon fiber. The spinning rods rate the same for braid as high as 80 lbs and as low as 55. Proteus WN casting models have line test ranges for monofilament and braided line. Fish with mono as low as 15 lbs (40 lb braid) or as thick as 60 lbs (120 lb braid). Daiwa designs the rod blanks of Proteus WN casting rods using a fine pitch taping technique. Layers of tape cross each other at 45 degrees, giving the proprietary technique the name Bias. Anglers will experience a big reduction of rod twist on the cast or retrieve as a result of this technology. It allows for more precision while casting and uses the full force of the blank when fighting powerful species. Note: Only the Daiwa Proteus WN casting rods feature the X45 Bias Graphite. Spinning rods have a style of use altogether different than casting rods. Daiwa understands the pressures that pull against the guides of the spinning setup and they construct the Proteus WN versions with a high volume fiber. HVF utilizes a higher modulus fiber with less resin. Daiwa Proteus WN spinning rods are lighter and more sensitive as a result of this material. 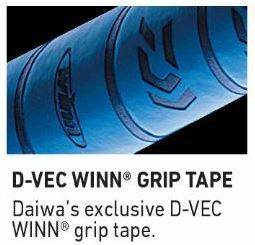 The namesake and most prominent feature of Daiwa Proteus WN rods is the new grip tape. Sweaty hands will keep a secure hold as Winn Grip Tape absorbs the moisture. D-Vec Winn Grips are strong enough to take the force of angry sportfish yet soft enough for maximum comfort throughout the battle. In addition to the new Daiwa X45 Graphite construction, BRAIDING-X technology further supports the rod blank. 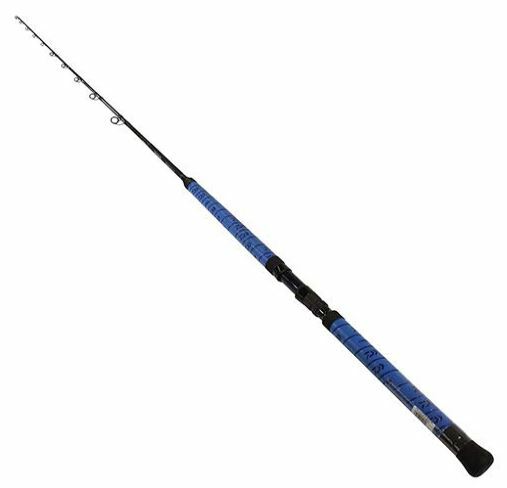 This braided carbon fiber material enhances the strength of the rod while also helping to remove any form of rod twist. Looking at the line guides of Daiwa Proteus WN rods shows another advancement in technology over the original series. Fuji makes quality guides but Fazlite inserts take a step up from their standard K-guides. 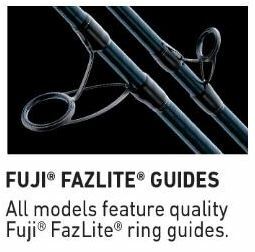 Overall, Fuji Fazlite ring guides are almost as durable as Alconite while offering a more cost-effective solution. It’s strong enough for braid with a smooth finish that lets line fly. 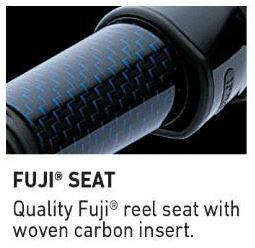 Woven carbon inserts add an element of style but more importantly reinforce the standard Fuji reel seats. Flashy when the reel is off, the carbon weave has a resin lamination and it boosts strength in the handle. Tighten your reel securely and slippage won’t be an issue as you do the tuna shuffle. Daiwa uses the quality of standard graphite Fuji reel which sport flashy metal hoods. With all the advancements in technology, Proteus WN rods are a notch above the original series at not too much of an extra cost. The Winn grips far surpass the level of comfort that the older X Tube Grip provides. As fast action rods, the Proteus WN bends mostly in the upper section of the blank. They are longer rods that start at 7’6″. That fact coupled with the flip in their tip section makes them perfect for casting. Though graphite rods are durable with proper care, they are much more likely to snap under a sudden increase in stress. This fact holds even more weight with higher modulus carbon fiber, such as that in the Proteus WN spinning rods. Keep graphite rods out of the sun and heat when not in use and they’ll keep their durability. Another feature of graphite material is how little it weighs. The lightweight quality of Daiwa Proteus WN rods should appear as a benefit, and it is. It does come with the disadvantage of imbalance if you pair it with heavier metal reels. Choices of reels in the Daiwa Saltiga series, Accurate reels, or the Seigler Small Game set the proper balance but can cost a lot more. Anglers can find a wide range of uses due to the variety of power ratings the series offers. As fast action rods, the Proteus WN is perfect for flipping live bait or adding some kick to your vertical jig. In this regard, the sturdy non-twist blank design will handle fish like yellowtail that eat a fast running jig. Anglers can fly line live bait with Proteus rods and they excel for feeling the slightest bites down deep. Daiwa rates the Proteus WN series for use with either mono or braided line. If you pair the fast action and quick recoil of the Daiwa with braid, you’ll have the ultimate sensitivity for rock fishing. Lines such as Daiwa J Braid x8 Grand, Power Pro Super 8 Slick, or Sufix 832 Advanced Superline meet most any challenge. Brands such as KastKing SuperPower offer a cheaper though riskier option. All Daiwa Proteus WN rods come with the assurance of a limited lifetime manufacturer’s warranty. Should you encounter any defects in craftsmanship over the span of your rods use, Daiwa will replace it. Note that all defects are subject to inspection and authorization remains at the discretion of Daiwa. For more information, FAQ’s, Contact or Warranty forms visit Daiwa.com. Daiwa Proteus WN rods score right in with the ninetieth percentile due to their obvious improvements in quality and technology. They lift the status of the Proteus collection without raising the price too much. Anglers get so much more in value and effective use that a little extra charge goes almost unnoticed. Share your experience with or ask a question about the new Daiwa Proteus WN collection of rods. Anglers will appreciate reading your advice in the comment section below and FishtFight will respond as soon as possible. Thanks for tuning in and tight lines until next time.